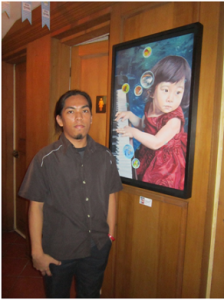 Eric Perreras is a Filipino Kapampanga painter born in Angeles City, Pampanga in 1986. A self-taught artist who began painting during his secondary education as a leisure pursuit until later on it became his profession by heart. His works are more on fantasy and futuristic vision which shows his insights into the depth of human mind and bring forth the world’s different dimensions and magnificence that he takes through the medium of Oil and Acrylic. Currently, Eric Perreras is focusing on Hyper Realism and Contemporary arts since modernization persuades the generation at present and focuses with the used of Acrylic as his main medium. However, his compassion with the Filipino culture is blazing deep within him and never mislaid such as the traditions, market scenes, harvest and scenery; he gives great credit and significance in regards with these. Be updated on our featured artist and collection, so please sign-up in our mailing list.